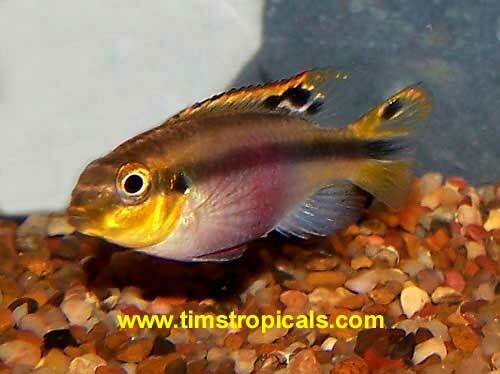 Dwarf Cichlids are specialty tropical fish that can also be a good beginners fish. The German Blue Ram has beautiful colors and the Krib can develop great colors during breeding. Both are nice additions to a community aquarium. 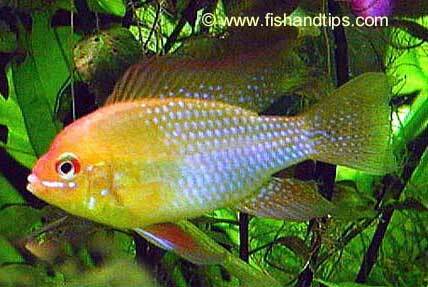 Ram Cichlids originate from the Orinoco River basin in Venezuela and Columbia. They are Dwarf Cichlids. 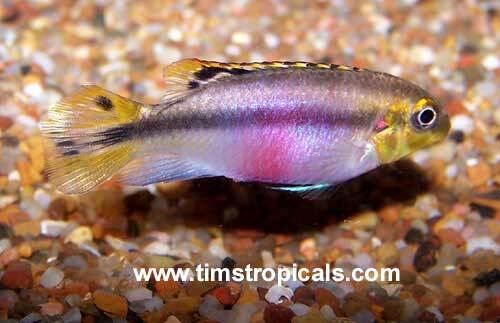 Their official scientific name is Mikrogeophagus ramirezi, but they are also referred to as Microgeophagus ramirezi, Apistogramma ramerizi and Papiliochromis ramirezi. 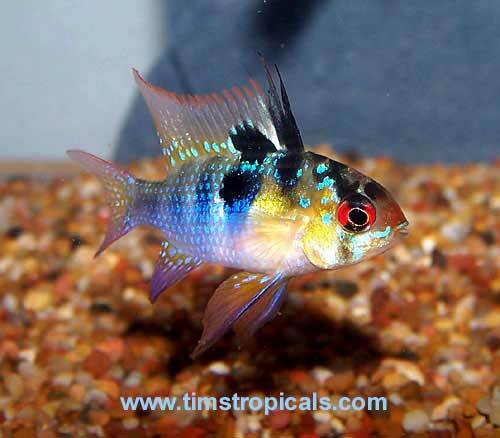 The Ram Cichlid is peaceful and moves slowly. It does well in groups and will benefit from pairing. A thick plant background with Amazon swords and hiding places is ideal. Tank mates should be of a similar size and disposition. 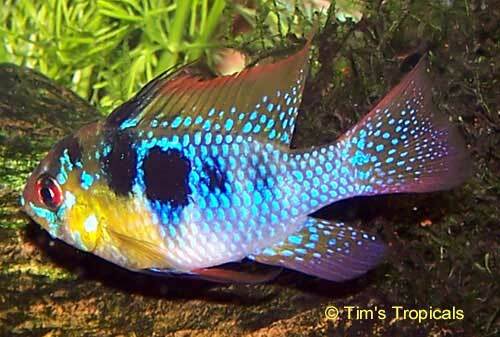 German Blue Ram Cichlids eat flake foods. Rams are very sensitive to water conditions and will stress easily, so they are not suited to the beginning aquarist. Clear water and proper pH are essential. Water changes should be performed frequently. German Blue Ram males have a more developed dorsal fin and lack any blue coloration in the black spot in the middle of the body. Males have pronounced black spiking at the front of the dorsal fin. Females are slightly smaller and are more pink on the underside. Provide two females with the male for breeding. Use soft water. Blue Rams spawn in the open and lay about 100 eggs. The parents will tend the young. The fry will hatch in a couple of days and will be ready for feeding live brine shrimp in just under a week. Comments by Bernie: Rams aren't really schooling fish but do like to be in pairs and preferrably in a species specific tank. They are timid fish and If used to being in a group and then finds himself alone, he can become overwhelmed by his tankmates especially if they are active tankmates. 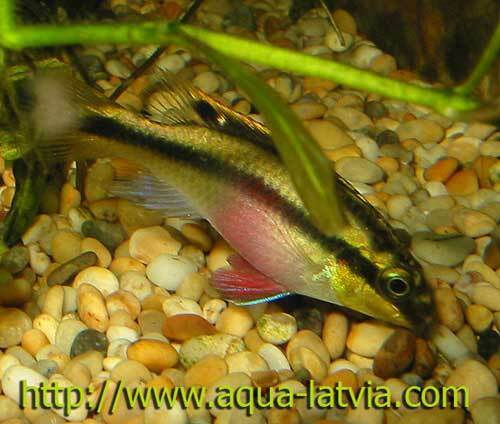 Pelvicahromis Pulcher, or the Kribensis, originates from the Niger Delta region of Nigeria. It is also know as the Rainbow Krib or simply a Krib. 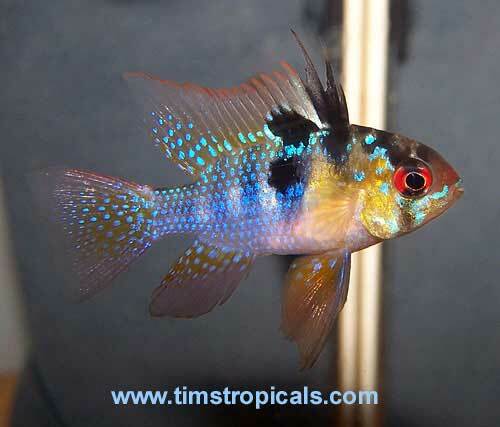 The name Pulcher means ‘pretty’ and is an accurate description of this beautiful dwarf cichlid. It is probably the most common small cichlid seen in pet stores, yet it shows a great deal of variety and coloration depending on the stock it originated from. Both the male and the female have a light brown to yellow body colour and two distinct dark brown to black stripes that run from the mouth to the tail. The dorsal fin colouration also varies a great deal with some fish showing distinct spotting and others a more shaded colouration. On the male, a bright band of colour runs on the top of the dorsal fin extending to the very tip. On females, the band of colour stops about a centimeter before the rounded tip. Another area of distinction is that the pectoral fin is pointed on the male and fan shaped on the female. 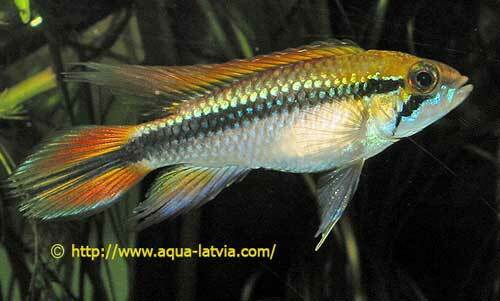 Both fish tend to show a bright red to purple stomach at breeding time. On some males, this colour can extend up to the mouth and makes for a very striking fish. Depending on the variety, the fish will display blue, green, yellow or red highlights on the pectoral fins, gill plates, and under the mouth. The tail again is an area of great variation in colouration and pattern with some fish showing spotting and others very little colour at all. 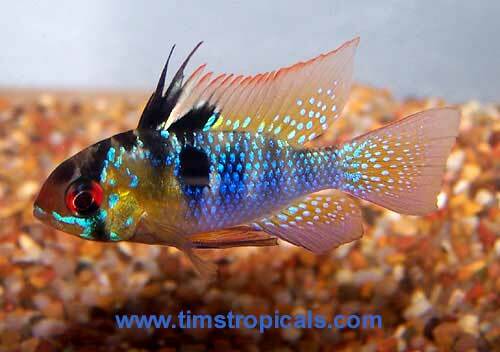 Take your time when choosing these fish from a pet store in order to select the nicest specimens. 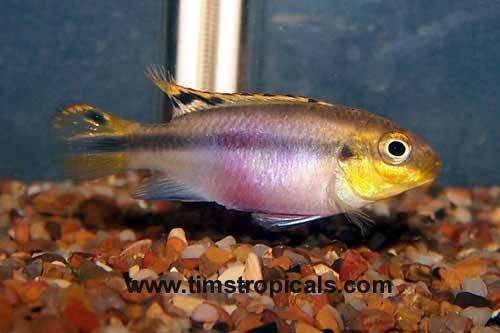 Pelvicahromis Pulcher can be kept in pairs alone in a tank as small as a twenty gallons, but the fish keeper should always monitor behavior, as some pairs will not always get along. These fish with a maximum size 10 cm in males and 7 cm in females can be kept in a community setting in tanks of 36 inches plus. Avoid tank mates that will need to share the bottom portion of the tank with these somewhat territorial fish, especially Corydoras. They like to nip the fins of slow moving species such as angels and guppies. 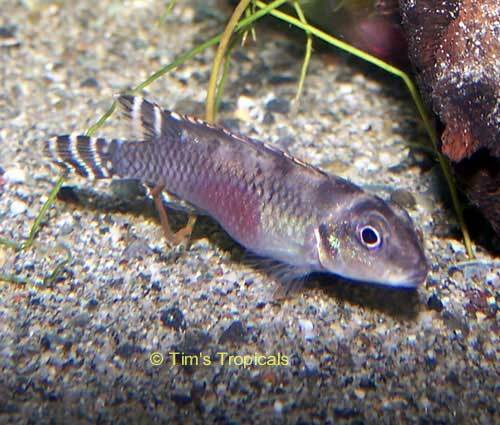 Pelvicahromis Pulcher thrives in a well planted tank with wood and stones to break up the tank. Gravel should be sized so that the fish can take it into their mouths. These are hardy fish, but regular partial water changes and good filtration are always advisable. 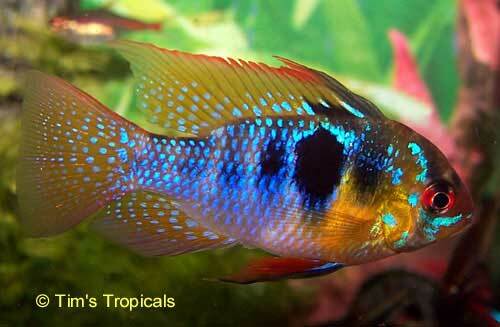 Cichlid pellets and spirulina flakes are a basic staple for Pelvicahromis Pulcher. They do not tend to be picky about feeding, but breeding can be induced with a varied diet including frozen foods. Pelvicahromis Pulcher is a cavity spawner, usually choosing a newly excavated cave site either under a piece of wood or inside a small, upturned clay flower pot. Breeding is not usually successful when other species are present. After spawning the female can be very aggressive toward the male. In a well established tank the fry can often be reared in the community tank, provided that there are few fry predators. The parents will protect the fry and lead them around the bottom of the tank. Be careful of filters that the parents may not be able to protect the fry from. The fry can be fed baby brine shrimp, but quickly begin to take powdered flake foods, making them very easy to raise. Check first that you will be able to find a home for your fry as many pet stores will not be able to take them. There are numerous hobbyists breeding these enjoyable fish. These fish can be kept with almost everything but the most delicate fish, but keep an eye out for aggressive behavior at times of spawning. The closer the fish is to wild stock the more aggressive it will tend to be. Most fish sold in stores are aquarium strains that have been long established in captivity and relatively docile, but wild or F1 fish are much more difficult to keep in a community setting.